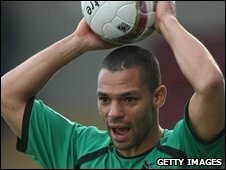 Bristol Rovers defender Aaron Lescott is one of 15 players released by the club while midfielder Mark Wright has been told he can look for a new club. Lescott, 31, is Rovers' longest-serving player having joined in 2004 and spent the last three months of the season at League Two outfit Cheltenham Town. Other departures include keepers Rhys Evans and Steve Phillips along with defender Steve Elliot. Mikkel Anderson and Daniel Jones have returned to their parent clubs. On his decision to release Lescott, manager Paul Trollope said: "We would like to thank Aaron for his efforts in over six years at the club. "He's given Bristol Rovers fantastic service and been an integral part of our squad." Trollope also revealed they are in talks with striker Andy Williams about a new deal. "We feel he's made steps forward this year," he said. "He's had some fantastic moments during the campaign and we would like to see him here next season." Other players released are David Pipe, Ben Hunt, Sean Rigg, Joe White, Alex Kite, James Tyrell, Neikell Plummer, Dan Cayford, Steve Kingdon, and Rob Holmes.